Dead Rising is back with more zombie killing goodness, in Dead Rising 2 players can expect a similar open world horror experience to the original with endless hordes of zombies just waiting to be dealt with. 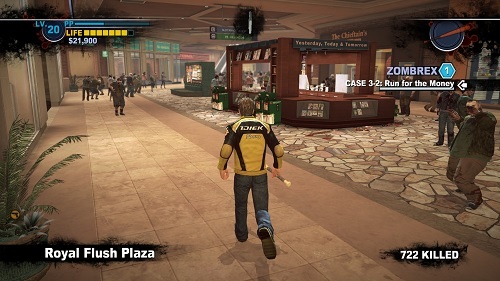 Dead Rising 2 takes place half a decade after the first Dead Rising and introduces a new protagonist into the game (Chuck Greene). The game setting has also changed and now takes place in a fictional town called Fortune City which feels very much inspired by the likes of Las Vegas. Chuck Green has come to this city to enter into a new game show where contestants must kill zombies for money. Chuck’s motives for entering aren’t selfish though as he needs the prize money for Zombrex, a medication that stops the zombie infection process for his daughter who was bitten in a previous zombie outbreak. During the show an accident leads to the entire supply of zombies to be released and over run the town. Chuck manages to escape with his daughter to a nearby shelter but must venture out to find Zombrex to stop her from turning. Based on your performance and success during the game players can expect one of six different endings. Just like the original game there is plenty of emphasis on the player creating their own weapons by combining items that they find around the game world. Players can unlock deadly combinations through combo cards that reveal some of the most powerful items in the game like the hand grenade attached to a football (named the Hail Mary). 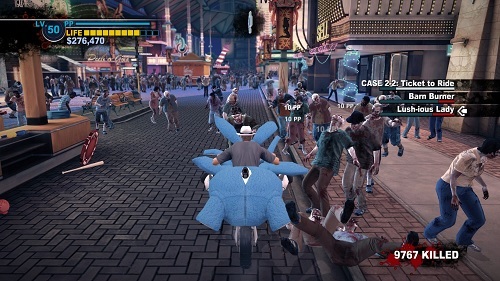 Dead Rising 2 has plenty of improvements that make it a much more friendly experience but at the end of the day it’s just the same game with a new skin. This limits the appeal towards newcomers to the series or diehard fans of the original looking for a repeat performance. Can you survive and save your daughter? Experience six different endings. Scavenge around the casino town of Fortune City for medicine and weapons. No shortage of zombies to deal with. Unique and hilarious combinations of weapons to make zombie killing fun. Plenty of ease of use improvements over the original.